Heritage bosses hope the popularity of Game of Thrones will inspire more people to visit Hadrian's Wall. Author George RR Martin has said he came up with his creation while visiting Hadrian's Wall. 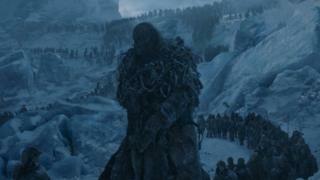 They are a reference to the Night's Watch guardsmen - a military order which guards the wall, which stretches 100 leagues (300 miles) along the northern border of seven kingdoms and is made of solid ice. English Heritage said other similarities were the oath taken by the Night's Watch, forbidding them to marry or to father children, similar to what was originally expected of the Roman soldiers. Game of Thrones is HBO's most popular ever TV series. The show is based on George RR Martin's A Song of Fire and Ice novels. Hadrian's Wall was built to guard the north-west frontier of the Roman Empire and runs 73 miles (117km) between Wallsend in North Tyneside and Bowness on Solway in Cumbria. The watchers will be able to answer questions about Hadrian's Wall and also about Game of Thrones, particularly how the Roman Wall inspired Martin's books. An English Heritage spokeswoman said: "We would love it if the story and programme inspired more people to come and see the wall for themselves."